After reading World War Z and spending many hours flicking through Woman’s Day, I think with a little ingenuity, the advice from the average women’s magazine can be turned to our advantage in the event of a zombie apocalypse. Take fashion, for example. Although the average outfit in a ladies magazine is designed to be worn by a toothpick with a tuft of hair, they can be easily be adapted as weapons. Consider the humble high heel – over the past six years they’ve grown by ten inches and now rsemble bayonets. A set of thirteen inch stilettos can easily with one kick punch through a zombies skull into their brains. The brick-thick balance soles are also heavy enough to club a brain-chewing ghoul. Other trends such as denim hot pants worn with sheer shirts acclimatize women to survive without minimal clothing in resource-poor sub zero temperatures. Diets can also teach us plenty about how to survive once the dead rise from their graves. Last week I read an article encouraging women to eat a salad which was basically made of glorified weeds, the type found in any field. Any crash diet of the kind found in ‘Cleo’ prepares women for he mass starvation whether telling us to eat nothing but a table spoon of yoghurt for breakfast or a mouthful of lean (rat) meat for dinner. After years of following these eating plans one can easily survive in an apocalyptic world where dinner has to be scournged from an abandoned factory, or the burned our remains of a 7-11. Fitness is also an imperative once there’s no more room for the dead in hell and I constantly feel guilty every time I pick up a magazine for not working off my candy bar by dancing for fifty minutes or doing yoga. However, adherence to the detailed exercise plans in women’s magazines could have their uses. Gwyneth Paltrow’s latest Thai kickboxing fusion ballet dancing could be ably adapted to slam rotting heads into walls. Rock climbing skills could be used to scale buildings to escape a shambling zombie horde. At the very least jogging will help me run for e rescue boat. The advice we can draw from women’s magazines is not restricted to the physical and material. I’m talking psychological warfare. The first thirty pages of most ladies mags are devotes to how celebrities act like sociopaths. These articles train us to expect everyone will some day screw us over, perfect for the inevitable betrayal we will face squabbling over dwindling food resources I’ve read t east ten different articles on the top ways to trim toxic friends – some of those are going to come in handy when the water bottles go missing. 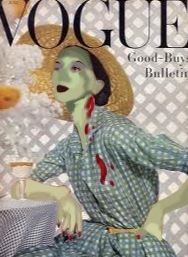 If we’re willing to take the advice of fashion magazines, it seems like we could survive an outbreak of the undead. That is, if we’re willing to starve ourselves, wear ankle breaking shoes, quit our jobs to take up Madonna’s work out regimen and become a Machiavellian psychopath. Personally, I think I’d rather be one of the walking dead. This entry was posted in Generally Geeky and tagged diet, fashion, fitness, undead, zombie. Bookmark the permalink.